Guitarist Chris Caffery (SAVATAGE/TRANS-SIBERIAN ORCHESTRA) has revealed that he will be joining METAL CHURCH for their upcoming US tour. He will be filling in for guitarist Rick Van Zandt, who has had to undergo surgery to fix a detached retina. “I’m really excited to announce that I will be playing guitar with the mighty METAL CHURCH on their upcoming US tour. Their guitarist Rick had a serious eye condition develop that needed surgery and we all pray for his continued, speedy and successful recovery. It will be a lot of fun to play with my longtime bandmate Jeff Plate and the guys. The first time I toured with Kurdt his band VANDERHOOF was opening for SAVATAGE. Then my solo band opened for METAL CHURCH on my Faces tour! Steve was on bass then at the time, all of these guys are amazing musicians. It's gonna be so awesome to hear Mike Howe every night! I watched him on the cruise and was blown away at how incredible his voice is! The first leg of the United States tour kicks off on March 24th in Portland, ME and runs through April 9th wrapping up in Rochester, NY at the Montage Music Hall with openers HATCHET. The record release party for XI will be the show on March 25th in Manchester, NH at the Jewel Nightclub. Admission to that show is free and is on a first come first served basis. 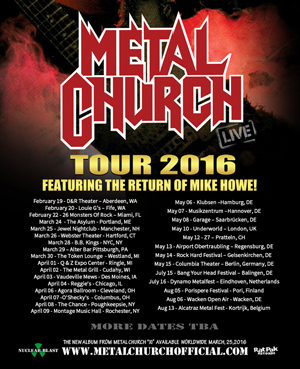 METAL CHURCH will be heading over to Europe in May and then return back to Europe for more dates in July and August. More tour dates to be announced in the near future. For more information on all upcoming tour dates, check out the official METAL CHURCH website right HERE. METAL CHURCH will release their new album, XI, on March 25th via Rat Pak Records. The band’s 11th studio release also marks the return of legendary vocalist and front man Mike Howe.